I love food from all over the world, but German is particularly special to me. My first memories surrounding food take place in Germany and I tend to fall back on these dishes for comfort. Unfortunately, German restaurants and cookbooks are hard to come by in many parts of the United States. For this reason, I always get excited when a new cookbook featuring German cuisine comes out. Das Cookbook: German Cooking . 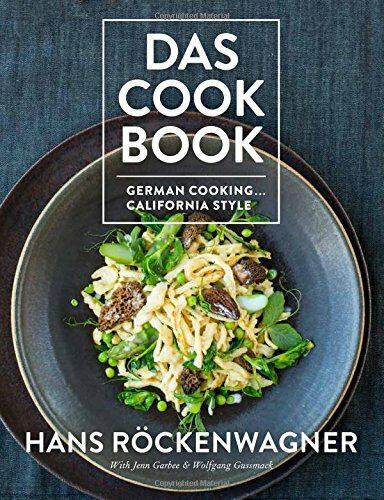 . . California Style , written by Hans Röckenwagner, highlights German dishes with a California twist. You will find some German and Austrian staples such as Spätzle, Mohr im Hemd, Glühwein, Pretzels, holiday cookies, and Hefezopf, along with the more California-style Quinoa Benedict, various salads and sandwiches, Avocado Fries, and Korean Flank Steak with Daikon Kimchee. Hans Röckenwagner was born in southern Germany and trained as a chef in the Black Forest and Switzerland before moving to the United States at the age of 22. He is now based in Los Angeles/New York and currently the owner of 3 Square Cafe, Röckenwagner Bakery, and Röckenwagner Bakery Cafe in California. The chapters are divided based on course: Our Daily Brot (Bread), Guten Morgen (Good Morning), Mittagessen Hour (Lunch), Stammtisch (Get-Togethers), Sprechen Sie Supper? (Do You Speak Supper), Das Fest (The Party), Das Dessert, and Pantry. Röckenwagner’s baking skills shine in this book, particularly in the bread and holiday sections. The pages in Das Fest will be well worn as the holidays draw nearer. There is also a detailed guide on how to make traditional pretzels. In the pantry chapter, you will find a guide to common ingredients, flours, and basic cooking techniques. There are also recipes for various stocks, condiments, and sauces. The average American cook will have no issues finding most of the ingredients needed for this book. Some of the less common ingredients include Persian cucumbers, Black Forest ham, tahini, daikon, Korean chili powder, and baker’s ammonia. The photography, by Staci Valentine, is particularly beautiful. You will only find food photos here. 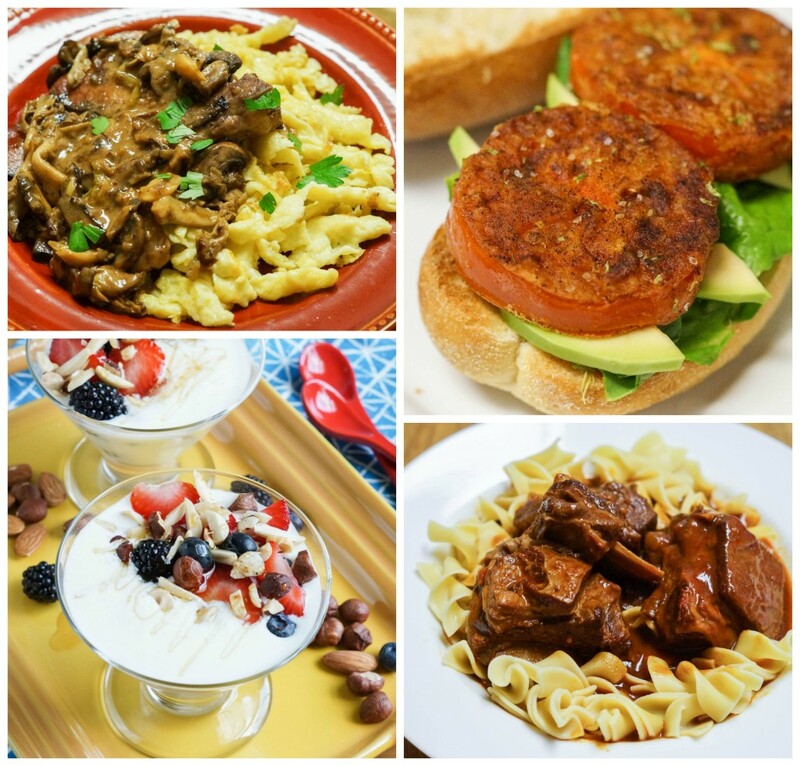 Many of the recipes include photos of the finished product, often full page. The pretzels contain step-by-step photos. This book may not be the best choice for beginning home cooks or those looking for weeknight recipes. Most of the recipes aren’t necessarily difficult, but they do take a bit of time and planning. This also isn’t for someone looking for only traditional German recipes. If you already have a basic knowledge of German cuisine and authentic cookbooks/recipes, but are looking to broaden your horizons a bit with a German twist then Das Cookbook might be right up your alley. 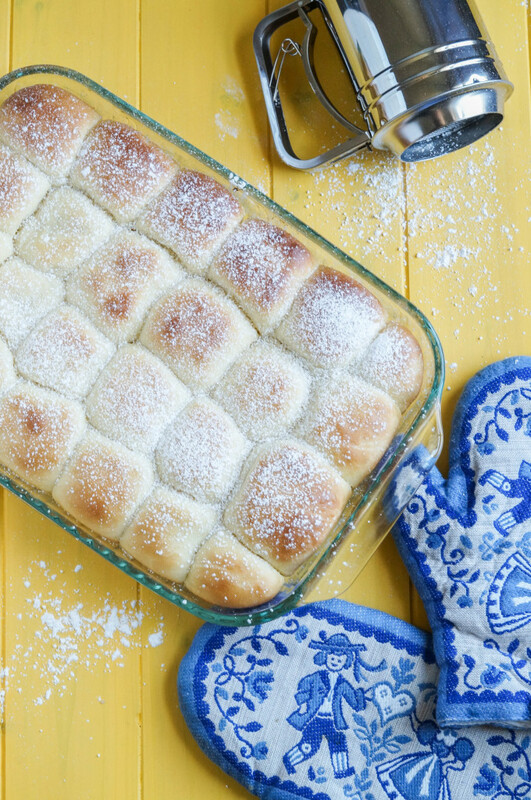 Buchteln are Austrian pull-apart rolls that are stuffed with various fillings. I went with the traditional apricot filling, but other jams, chocolate, or poppyseed paste can also be used. Röckenwagner noted that they were even filled with lottery tickets in the 1800s. 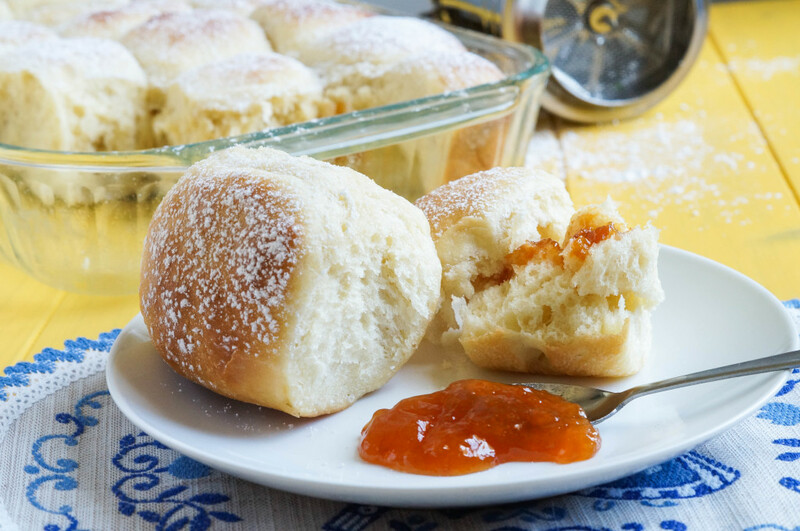 If you want to go completely traditional, you can serve these rolls as a dessert with a vanilla cream sauce. The rich dough is sticky at first, but it becomes smooth with rising and stretching. 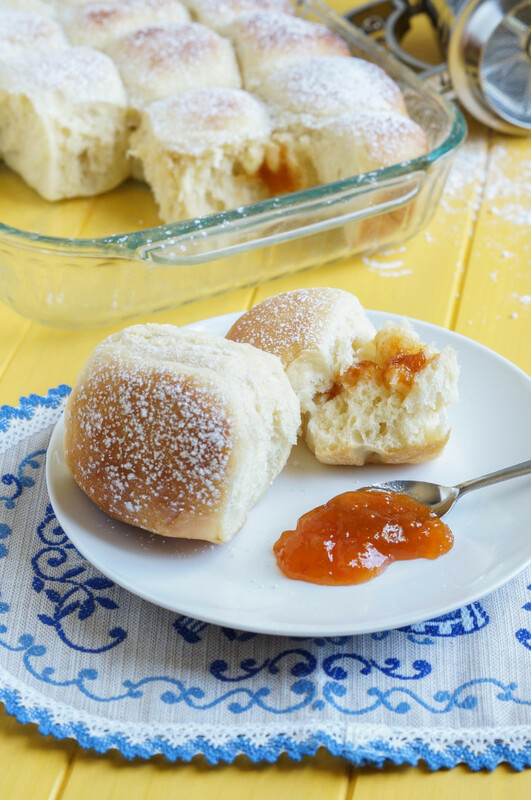 These rolls can also be prepared the night before and refrigerated until ready to bake the next morning. Allow them to sit at room temperature for an hour before baking. Work as quickly as possible, without becoming sloppy, when shaping and filling the rolls to keep them from continuing to rise too long. The Buchteln were most delicious (and definitely on the addictive side) warm from the oven. They are best within a day of baking. I also made Jägerschnitzel with Spätzle, Blackened Tomato Sandwich, Homemade Quark with Berries and Honey, and Short Rib Goulash. Jägerschnitzel is one of Chad’s favorite German dishes, so it was requested when he saw it in the cookbook. “Hunter’s schnitzel” is made by pounding a pork chop thin and smothering it in a mushroom cream sauce. Röckenwagner has elevated this dish to the next level (and made Chad love it even more) by wrapping each pork chop with thin slices of Black Forest ham. I served the Jägerschnitzel with Classic Spätzle. Like Röckenwagner, Spätzle is one of the first foods I learned how to make and holds a special place in my heart. I normally make a thinner dough to use the Spätzle Grater, but it was fun following his recipe to cut the dough into the boiling water by hand. This way takes some practice to get the noodles the right size, but requires no special equipment and results in a light, fluffy noodle when done correctly. He includes a section on the various ways to create Spatzle, plus a recipe for tossing the noodles with mushrooms, herbs, and spring vegetables (the photo on the cover). I have actually never had a fried green tomato (which is even more surprising since I spent a few years in the Southern United States), but these pan fried ripened red tomatoes are quite delicious as a Blackened Tomato Sandwich. Slices of ripened, but still firm, tomatoes are seasoned in a light breading, then pan-fried on a hot skillet and assembled on a sandwich with avocado slices, lettuce, and a Chipotle Aioli. The Chipotle Aioli can be made a couple of days in advance for a quick lunch. Quark (translates to curds in German) is a fresh creamed cheese with a texture similar to Greek yogurt. It is a great breakfast item that low in sodium, lower in fat than cream cheese, but high in protein and other nutrients. When I lived in Florida, it wasn’t available in any supermarkets like it is here in the D.C. area. I don’t know why it never occurred to me to make my own. It is actually quite easy, especially if you have made yogurt. Röckenwagner’s homemade version will keep for about a week in the refrigerator, making it a quick breakfast option. I have a freezer filled with a quarter of a cow and recently unearthed the short rib section. I used some to make the Short Rib Goulash. This takes a couple of days to make (it needs to refrigerate overnight to deepen the flavor), but is definitely worth it in the end. I served the Gulasch with egg noodles, but Spätzle would also work well. Disclaimer: I received this book from Prospect Park Books in exchange for my review. All comments and statements are my own. In a small bowl, sprinkle yeast over the milk. Allow to sit for a minute before stirring to combine. Let sit until frothy, 5-10 minutes. In the bowl of a stand mixer fitted with a paddle attachment, beat together 5 tablespoons butter and sugar until smooth. Beat in eggs, egg yolks, and salt. Mix in the milk and frothy yeast. While mixing on low, slowly add 1 cup of the flour. Once combined, slowly add in the remaining 3 3/4 cups flour. Scrap down the bowl as needed. Remove the paddle attachment and replace it with the dough hook. Mix on low until the dough is smooth and soft. It will be sticky. With buttered hands, transfer the dough to a buttered large bowl, turning to coat. Cover with a towel and allow to rise for 30 minutes. After 30 minutes, use buttered hands to fold one side of the dough towards the middle. Fold the opposite side over it, then repeat with the remaining two sides. Flip the dough so the smooth part is now on top. Cover and allow to rise for 15 minutes. Repeat the folding process again, flip, then cover for another 15 minutes. Preheat oven to 350 degrees F and grease a 9×13 inch glass baking dish. On a lightly floured surface, form the dough into a 12×12 inch square. Divide the dough into 24 equal pieces by cutting 4 equal strips vertically and 6 horizontally. Take one piece of dough and gently stretch it into a flattened square. Place about 1 teaspoon of jam in the middle, making sure to not get any on the edges. Gently pinch together the edges over the jam to seal. Place in prepared baking dish, seam side down. Repeat with remaining dough. Pour the remaining 3 tablespoons of butter evenly over the rolls. Cover with a towel and allow to rise for 30 minutes. Bake uncovered in preheated oven until baked through and golden brown, 24-28 minutes. Allow to cool in pan for 15 minutes before dusting with powdered sugar and serving.